This letter is addressed jointly to the Secretary of State for Transport because CCAL understands that the Department for Transport (DfT) has joint responsibility with Defra for the UK meeting its legal obligations in respect of air quality. The Prime Minister has been copied, given the cross-departmental issues raised, and all London’s MEPs and others have been copied given that the Commission has already started legal action against the UK for failing to notify a time extension by the deadline set by the Commission of 31 October 2008. As you know, only the UK, Cyprus, Estonia, Portugal, Slovenia and Sweden out of some 24 countries have failed so far to submit any time extension notification plans to the Commission. In CCAL’s carefully considered view, the UK does not satisfy either of the pre-conditions for it to obtain a time extension to comply with limit values for PM10. In particular, the UK fails to pass either the ‘First condition’ – measures to achieve compliance by the initial attainment date; or the ‘Specific condition for PM10’ – site-specific dispersion characteristics, adverse climatic conditions or transboundary contributions. Both of these pre-conditions must be met if the UK is to obtain a time extension to comply with limit values for PM10. CCAL would need to be completely wrong on every point made in this letter in connection with the above pre-conditions if the UK is to be eligible for a time extension to comply with limit values for PM10. This seems highly unlikely given that the questions are ones of fact. Furthermore the UK has made no reasonable effort yet to satisfy the ‘Second condition’ – measures to achieve compliance before the new deadline. It has not been helped in this regard by: its reliance on measures that the Mayor of London says he plans to scrap or suspend; its vague words about committing to work with the Mayor of London; and/or its obvious non-compliance over at least part of the London road network even by 2011 (i.e. six kilometres or is it 12 kilometres with modeling errors?). CCAL will therefore urge the Commission to ‘throw the rule book’ at the UK and reject its time extension notification (TEN) for failing to meet the conditions necessary for such a time extension unless the UK submits a wholly convincing and timely plan by the deadline set by the first written warning (i.e. Letter of Formal Notice). 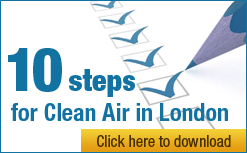 To be wholly convincing, such a plan must be backed by all necessary funding and immediate action to ensure that limit values for PM10 will be complied with sustainably throughout London by no later than 11 June 2011. CCAL will urge the Commission to progress vigorously legal action, in parallel with any consideration of a belated TEN from the UK, against the UK and the five other Member States that failed to submit a TEN by the Commission’s deadline of 31 October 2008. These countries are clearly in need of ‘encouragement’. Otherwise, what incentive would there be in future for any country to comply within the first six months of a deadline set by the Commission? CCAL understands that the fines against the UK could total £300 million just in respect of PM10. The Commission is not on some ‘frolic’: all the fault sits at the government’s feet after more than 10 years of inaction and disregard for deadlines and/or repeated warnings. CCAL urges the government to learn now from its serious failings to comply with limit values for PM10 – including the current difficulties it faces in applying for a time extension – and to propose and implement rapidly plans to comply fully with limit values for NO2 by January 2010. In CCAL’s carefully considered view, the UK is likely currently to miss – by a large margin – not just the limit values for NO2 due to be met since 1999 by January 2010 but also the limit value plus margin of tolerance which must not be exceeded if the time extension provisions are to be used. CCAL considers currently therefore that the UK should not waste everyone’s time by submitting a TEN on NO2 – it should instead focus all its energies on complying urgently with the limit values for NO2 (as it will need to do when legal action is surely launched against it). The UK needs a convincing action plan for NO2 now. Finally, the UK seems to be one of the least compliant countries and worst ‘free-riders’ in the whole of Europe when it comes to complying with air pollution legislation. We need urgent and energetic cross- departmental action, lead personally by the Prime Minister, if sustainability issues are to be addressed holistically. The UK breached also air quality laws for PM10 in 2008. You will be well aware too that poor air quality has serious implications for public health. It results in between 12,000 and 24,000 premature deaths each year in the UK. Those with asthma, lung diseases and heart conditions are the most susceptible. These numbers compare with some 617 premature deaths per annum from workplace-related passive smoking before recent legislation came into force and up to 22,000 premature deaths per year from alcohol consumption. The excellent Rogers Review estimated that in 2005 the UK’s annual cost of health impacts from just one form of air pollution, PM10, was between £9.1 billion and £21 billion. It is unacceptable that these health based standards are still far from being met. Usually two months thereafter the Commission may ask the European Court of Justice (ECJ) for a judgment against the UK. If the UK fails to comply with the ECJ’s judgment, the Commission may ask the ECJ to impose unlimited lump sum and daily fines on the UK. CCAL understands that the fines against the UK could total £300 million just in respect of PM10. In seeking such fines, the Commission would not be on some cruel ‘frolic’: all the fault sits at the government’s feet after more than 10 years of inaction and repeated disregard for deadlines and/or warnings. CCAL understands that the UK may notify the Commission when, in their opinion, the conditions are met in a given zone or agglomeration for postponing the attainment deadline for the limit values for NO2 and benzene or for being exempt from the limit values for PM10. the exceedances during the extension will remain below the limit values plus the maximum margin of tolerance provide for in Annex XI to the new AQ Directive. In other words, for PM10, the UK may wish to seek an exemption for historic breaches of limit values in 2005, 2006 and 2007 and prospective breaches of limit values in 2008 (which are still to be reported upon), 2009 and 2010. CCAL understands that the UK plans currently to seek (in late 2009 or early 2010) a time extension to comply with the limit values for NO2 until January 2015. Note that the Specific condition will not be applicable for NO2 (or benzene). If the Commission does not raise objections within nine months of receipt of an official and complete notification, the limit values for NO2 and benzene are postponed from 1 January 2010 to January 2015 at the latest. For PM10, the exemption from the limit values will in that case apply for up to three years ending on 11 June 2011. In CCAL’s carefully considered view, the UK does not satisfy any of the three conditions for it to obtain an exemption from the limit values for PM10 in London. As you know, each zone and pollutant will be assessed individually. Defra cites Marylebone Road as representing the worst air quality in London. CCAL’s analysis of the three conditions follows below. d) the Commission makes clear in paragraph 23 on page 6 of the Communication that, in its assessment it will also take into account the impact of correct transposition and implementation of the Directives included in Section 2 of Part B of Annex XV and of timely availability of the plan or programme in accordance with Article 8(3) of Council Directive 96/62/EC on ambient air quality assessment and management. Perhaps, most importantly though, the Commission should be checking whether the UK has transposed correctly the primary air quality legislation. In this regard, in just one example, it is clear that the UK has failed to transpose and/or implement correctly even the most fundamental details of the legislation. The UK defined a limit value in its Air Quality Standards Regulations 2003 and 2007 as a “concentration” when all the EU Directives have defined a limit value as “a concentration to be attained within a given period and not to be exceeded once attained”. This is an extraordinary failure by the UK. It is astonishing that the UK has failed to transpose or implement correctly crucial legislation that has, at its heart, a framework to protect public health. In conclusion, it is clear to CCAL that the UK did not adopt or implement adequately measures to reduce PM10 levels in Greater London by the initial attainment date. Therefore, the UK does not satisfy the first condition necessary for a time extension. CCAL has submitted a Freedom of Information/Environmental Information Request to the Greater London Authority seeking further information about the Marylebone Road site and other sites in London. Even Defra admits (rightly) that strict site-specific conditions do not apply at the Marylebone Road site. It is clear to CCAL that, even if they did (and they do not), the UK could not justify a time extension because similar problems exist also along less densely built up streets and/or in the urban background. CCAL notes and agrees with Defra that the UK cannot consider adverse climatic conditions to have caused the breaches of limit values for PM10 in London in 2005. This exemption is designed to allow time extensions only where air pollution generated in another country is a major cause of breaches of standards elsewhere. It is designed for countries such as The Netherlands and Belgium which experience significant problems from French and German air pollution drifting across their borders. c) furthermore, even if Transboundary contributions were the cause of breaches of limit values in Marylebone Road (and they were not), paragraph 40 on page 9 of the Communication makes clear that “Member States claiming a transboundary contribution must indicate whether consultations have been held with the Member State in which the pollution originates, in accordance with Article 8(6) of Directive 96/62/EC (Article 25 of the new AQ Directive). If no such consultations have taken place, despite the origin of the pollution being known, the Member State concerned may be considered not to have taken all appropriate measures to meet the original deadline”. CCAL has found no evidence in the consultation documents that the UK has complied with this condition partially or fully. CCAL has asked Defra separately for evidence that such consultations took place. In conclusion, it is clear to CCAL that none of site-specific dispersion, adverse climatic conditions or transboundary contributions were responsible individually or in any combination for the UK failing to achieve compliance with the limit values for PM10 in Greater London by the initial attainment date. Therefore, the UK does not satisfy the Specific condition for a time extension for London. Even if the first condition and the specific condition were met by the UK for PM10 in London (which CCAL does not consider is the case), the UK must prove that it will achieve compliance with the limit values before the new deadline. The UK must also prove that the exceedances during the time extension period will remain below the limit values plus the maximum margin of tolerance provided for in Annex XI to the new AQ Directive. In CCAL’s views, Defra’s current such plans make no effort to address this problem. f) finally, please note that, despite warm words in the consultation document about existing measures being likely to deliver compliance with the limit values, there is evidence that air pollution has started in 2009 at higher levels in some parts of London that in the same period in 2008. For example, please check monitoring sites in Brompton Road and Kings Road. In conclusion, it is clear to CCAL that the UK is still far from showing: how it will achieve compliance with the limit values for PM10 in London before the new deadline; or that exceedances will remain below the limit value(s) plus maximum margin of tolerance if the time extension provisions are used. d) CCAL finds inexplicable Defra’s cost-benefit analysis in the ‘Summary: Intervention & Options’ paper. First, the report should be about cost-effective compliance with health based legal deadlines not weighing up the likely costs of legal action for breaching those laws. Second, it is ridiculous to weigh the costs of a national scheme for the abatement of particulate matter against the need to adopt additional measures to improve air quality in London only. Such analysis is anyway irrelevant and 10 years too late since the UK either did or should have done such analysis before signing up to the legal framework for air quality laws in 1999. CCAL was pleased to see however that the Ministerial sign-off includes, for the first time, a consideration of the ‘impact of the leading options’ instead of just costs and benefits when legal deadlines must be met to comply with air pollution standards. Please will the government change the statement to read – when environmental deadlines must be met – to “I have read the Impact Assessment and I am satisfied that it represents the correct view of the most cost effective and practical means of complying with the UK’s environmental obligations”. Please note that CCAL is responding to the consultation, in general and subject to the above exceptions, only as it relates to London. Please take urgent action to remedy this wholly unacceptable situation and comply fully with the UK’s legal obligations in respect of limit values for NO2. iv. thereafter, if the UK fails to respond appropriately and urgently to an ECJ judgment, the Commission should press for unlimited lump sum and daily fines against the UK. CCAL understands that these fines could reach or exceed some £300 million. With speculation that relations are breaking down between the (Labour) government and the (Conservative) Mayor of London, CCAL urges both parties to seek common ground and protect the public health of Londoners. vi. implementing urgently a comprehensive package of measures to tackle emissions from a wide range of other sources e.g. demolition and construction; incinerators and other regulated sources; and gas boilers. Other measures may be needed but they must be timely and shown to be effective. It is essential that PM10 and NO2 are addressed holistically if cost savings are to be achieved. Please work together to deliver urgently the above measures to protect the health of Londoners. For the avoidance of doubt, CCAL reserves all its legal rights to take action on the matters raised in this letter and otherwise. Please respond to this letter by addressing fully the points made in an urgent UK submission to the Commission and by taking decisive action now to comply with limit values for NO2 and PM10. Thank you and your many colleagues for all that you do to improve air quality in London. Please confirm receipt of this letter to the electronic email address provided separately.